NOTE: This post is targeted at rising juniors (10th graders as of May 1, 2018). If you have already taken the PSAT (11th graders of May 1, 2018), check out this post instead. Summer is a great time for rising juniors to learn about the PSAT and determine whether it’s worth preparing for the test to potentially qualify for recognition and funding under the National Merit Scholarship Program. Alaska students earning Semifinalist, Finalist, or Winner status have access to generous scholarship opportunities at a variety of colleges. In this post, we’ll break down what’s on the PSAT, how the National Merit Scholarship Program works, and what rising juniors should do ASAP, ideally by August, to see where they stand. The PSAT helps preview your expected SAT score and enters you into the National Merit Scholarship Competition when taken in October of your junior year. Awards for National Merit Winners—and even Semifinalists and Finalists, in some cases—can include full tuition at nearby popular colleges such as Washington State, as well as annual stipend scholarships at top-ranked institutions like Northwestern University, University of Chicago, and University of Oregon. Sophomores are sometimes also offered the opportunity to take the test, although only a student's junior year PSAT scores are evaluated for National Merit purposes. You must score in the top (approximately) 1% of Alaska students to achieve Semifinalist status. For rising juniors (Class of 2020), we estimate this score will be at least 1400 (with an Evidence-Based Reading & Writing score of at least 700). Learn more about interpreting your PSAT score for National Merit recognition purposes. Rising juniors (10th graders as of May 1, 2018): Ideally before August 15, 2018, take a practice SAT, which will approximate your performance on the PSAT. 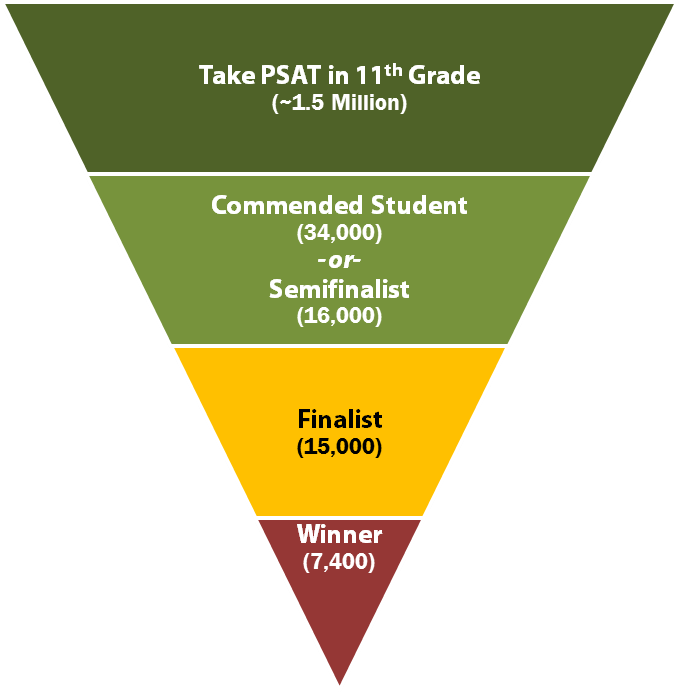 If your practice SAT score is at least a 1250, consider studying for the PSAT since you may be able to improve your score to become competitive with the National Merit Semifinalist qualifying range. Our SAT Prep Class starting August 5, 2018, or August 19, 2018, will prepare you for the October 2018 PSAT. Our average student improves by 107 points, with the top 25% of students averaging a 173 point score improvement. We guarantee a score improvement of at least 70 points. If you need a customized schedule or prefer one-on-one instruction, our SAT Individual Prep programs will also prepare you for the October 2018 PSAT. If you're reading this after August 15, 2018, and before October 1, 2018: You should still take a practice SAT, and if you score at least a 1250, consider studying for the PSAT through an SAT Individual Prep program. The PSAT reflects the format and content of the redesigned SAT. It includes questions in three sections (Evidence-Based Reading, Writing, and Math) and does not penalize students for guessing incorrectly. PSAT and SAT scores are designed to be comparable in common terms, although the PSAT tests a slightly less advanced domain of knowledge. For that reason, while your total SAT score could range from 400 to 1600, your PSAT score can range from 320 to 1520. The PSAT is not used for college admissions, but it does preview your expected score on the SAT. You should also take a free practice ACT so we can help you determine whether you should focus on the SAT or ACT for college admissions purposes. How does the National Merit Scholarship Program work? Stage 1: Take PSAT (October of 11th Grade): The PSAT will be offered at, or arranged by, your school. Contact your high school counselor for registration information. 16,000 additional students, representing the highest scorers in each state, are designated Semifinalists and continue in the competition. Stage 3: Finalist (February of 12th Grade): Semifinalists may compete to be Finalists by earning a qualifying score on the SAT, maintaining a high GPA in challenging coursework, and completing a written application, among other requirements. Nearly 95% of Semifinalists (15,000 students) are designated Finalists. Finalists, and even Semifinalists, can qualify for generous (in many cases, full, four-year tuition) scholarships at certain colleges, several examples of which we have listed in the summary above. Stage 4: Scholarship Winner (Starting in March of 12th Grade): The National Merit Scholarship Corporation awards scholarships to approximately 7,400 Finalists based on their academic performance, coursework rigor, extracurricular activities/leadership experience, and essays. Awards can include the $2,500 National Merit Scholarship or annually renewable college-sponsored Merit Scholarships, such as those listed in the summary above. Should I study for the PSAT? Could I qualify as a Semifinalist, Finalist, or Scholar? If your baseline score is below the estimated score necessary to qualify for Semifinalist status (estimated to be at least 1400, as explained above), determine whether it is realistic to close the gap through studying. Students taking our SAT Prep Class (which also prepares students for the PSAT) average a 107 point score improvement, with the top 25% of students averaging a 173 point score improvement, and we guarantee a score improvement of at least 70 points. As a result, if your practice SAT score is at least a 1250, you have a reasonable chance of improving your score to the Semifinalist range by taking our class. Our SAT Prep Class starting on August 5, 2018, or August 19, 2018, prepares for the PSAT in October 2018. If you need a customized schedule or prefer one-on-one instruction, our SAT Individual Prep programs will also prepare you for the October 2018 PSAT. Even if you don’t ultimately achieve Semifinalist status, studying for the PSAT will have been time well spent, since doing so also prepares you for the SAT and builds skills useful for the ACT. If you are a rising junior, remember: No matter what, Step 1 is to take a free practice SAT and ACT. Your practice SAT score can be used to determine your chances for National Merit recognition and whether you should study for the PSAT. Your practice ACT score can be used to determine whether you should focus on the SAT or the ACT for college admissions purposes. And, as always, feel free to get in touch with any questions about your testing or college admissions strategy. This information is a general summary of the requirements as of the post date. For additional information about the mechanics of National Merit selection, visit nationalmerit.org.